ASUSTOR Community Forum • View topic - ASUSTOR and Seagate Launch New IronWolf® Health Management Software! ASUSTOR and Seagate Launch New IronWolf® Health Management Software! Upgrade to ADM 3.2.2 to enjoy Seagate’s newest version of IronWolf Health Management today! 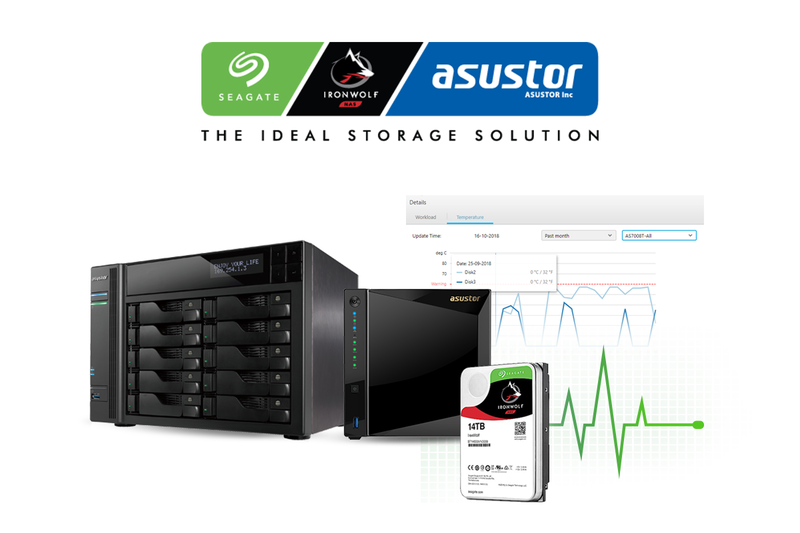 Seagate and ASUSTOR are helping you make monitoring hard drives and improving system reliability easier than ever. ASUSTOR, working closely with Seagate Technology, a global leading data storage company, will be launching the new IronWolf® Health Management, and will be officially launched in the next version of ADM. ADM 3.2.2 has improved IronWolf® Heath Management by implementing graphical charts to provide users with a clear view of hard drive health, workload and temperature analysis as well as regularly scanning drives, to maintain optimal performance and security in an ASUSTOR NAS. IronWolf® hard drives running on an ASUSTOR NAS enable critical parameter analysis, interception, containment and quick resolution when health management scanning is enabled. IronWolf® hard drives will also collect other operational information such as workload and temperature to further optimize system performance.